Secrets Excellence Punta Cana, an adult-only resort, is a combination of luxury and beauty. Secrets Excellence Punta Cana is an adult-only resort located in Punta Cana, on a stunning secluded stretch of fine sandy beaches. Excellence’s guests will enjoy the luxurious rooms and the many facilities and amenities available, especially the well appointed fitness center and the soothing effects of the Spa treatments. You will also be astonished by the culinary staff’s special abilities to prepare a great variety of dishes from al over the world. Enjoy a romantic dinner by candlelight at the beach restaurant, by the pool or at one of the seven restaurants available. You can also get a palapa, relax by the pool, get a dip if it is too hot or swim up to the bar for a drink to cool down. Embrace clear turquoise Caribbean waters, feel fine white sand under your feet, or just laze under a palapa shade to gaze at the wonderful view; it will be great food for your soul, whereas your mind and body will feel it was worth the trip. A Resort Just for You! A romantic escape on a secluded beach, a private paradise! Excellence Punta Cana’s secluded beach will give you a feeling of absolute privacy. Enjoy the feeling of lying on the fine warm white sand by Caribbean turquoise waters and plunge into the sea if it gets too hot, play with the waves, relax in the shade of one of the many palm trees and feel the topical breeze on your face. No matter what your preferences are, Secrets Excellence Punta Cana’s beach is the ideal place to ease every day’s tensions and enjoy a perfect vacation. Excellence Punta Cana Review Restaurants and Bars: You can choose from seven different restaurants at Excellence Punta Cana. Have breakfast at the international buffet; enjoy Italian, American, Mexican, Japanese or Contemporary Continental cuisine. Indulge yourself in a sea food dinner at the romantic seaside restaurant. There are seven different bars at Excellence Punta Cana. Swim or drop by one of the palapa bars spread around the resort to enjoy a domestic or international beer, a glass of wine or one of the local signature cocktails while making new friends or practicing your salsa dancing. The “Secret” of Excellence Punta Cana is that this adult-only resort is clear about what clients are looking for and does everything to please them; room service round the clock, in room mini bar stocked, both at no extra charge and food, just beyond any expectations. Enjoy the savor of excellent International cuisine in a friendly Caribbean atmosphere. Try your luck out at Roulette, Black Jack, slot machines or any card game and enjoy a thrilling and exciting night at Secrets Excellence Punta Cana Casino or bar. 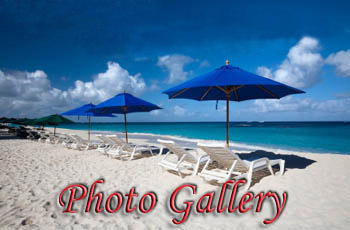 Secrets Excellence Punta Cana will really pamper you with its luxurious and romantic colonial-style rooms. Excellence Punta Cana Review of Rooms: All the 446 rooms at Secrets Excellence Punta Cana are luxuriously equipped with a four post canopy bed, a private Jacuzzi for two, bathrobes and showers. In addition, they all include air conditioning and full satellite TV, which makes you feel more comfortable while you are in your room, even if it is not too long. A telephone, a safe deposit box, a hair dryer, a coffee maker and an iron and ironing board are also available. If you feel hungry in the middle of the night, the mini-bar and 24 hour room service are there to take the edge of your appetite. The Excellence Club is available for a fee to customers in premium-priced rooms. It provides special services which include a private lounge with free Internet access and an all-day buffet. Nothing you could have imagined will be missing. Secrets Excellence Punta Cana will really pamper you with its luxurious and romantic colonial-style rooms. Wash stress away in the huge winding pool, floating under bridges or swimming up to one of the palapa bars. Cool down in the smaller pool to the relaxing sound of the waterfall and if you really want to pamper yourself get a swim-out suite, so you were just a step from the pool. Have you been craving long for a Caribbean spa getaway? The Secrets Resort Spa offers all kinds of treatments. Make an appointment with their professional staff. Feed your mind, body and soul at the Secrets’ all natural Spa. Cheer up! Work Out the Winter Blues at the Fitness Center! If you feel a Caribbean workout is just what you need to get rid of your winter blues, take advantage of the fitness center. Push yourself to a higher level of physical well being. Excellence Punta Cana Review Activities: Enjoy the thrilling night life at Excellence Punta Cana all inclusive resort: a world famous magician, a jazz jam, Elvis impersonation or a Rock and Roll party at the beach-side. Vacation lovers will be delighted with a moonlit horseback ride. This and much more is awaiting for you at the Secrets Excellence Punta Cana. Pick up from the list what best suits you and Go! Designed especially for weddings, honeymoons or couples looking for a romantic escape, this five star all inclusive hotel, located in a relatively remote beach area, 35 miles from Punta Cana International Airport, is a place where luxury, comfort and excitement equal excellence. It is not difficult to find a nice, beautiful spot for your Weddings at Secrets Excellence, but there are two special locations for wedding ceremonies at Excellence Punta Cana. A beautiful carriage drawn by horses could deliver you from the entrance of the hotel to an amazing wedding gazebo, or you could choose a decorated Arch on the beach for your wedding setting. Every resort in Punta Cana is beautiful but what makes Excellence Punta Cana Weddings special is just a combination of different things. Romantic atmosphere, thorough organization and highly personalized services make Secrets Excellence ideal for weddings and honeymoons. Excellence Punta Cana Wedding packages include coordinating services, preparation of wedding outfit, a complimentary room for the groom the night before the wedding if available, a discount for spa services, the officiant, the use of the resort’s wedding gazebo, a horse-drawn carriage, wedding cake and sparkling wine. Excellence Punta Cana Wedding program includes all you need: services, installations, food, drinks. It is conceived so you didn’t have to worry about these little things. You just need to take advantage of it. There are two pools: an oceanfront pool that stretches throughout the property, with waterfalls and a main pool, there is a great number of water sports, horseback riding, bike outings, a fitness centre and a full-service spa. One of the Secrets of Punta Cana Weddings is that they know how to prepare a special occasion menu for your wedding reception. For there are Consult our weddings and honey moons special packages more information. Try the Secrets of Punta Cana Weddings. If you decide on Excellence Punta Cana Weddings we are sure your choice will meet your expectations. You will fall in love with Excellence.